…How does any of this feedback help you? Plain and simple, it doesn’t. Family and friends love you. They want to give you feedback, but they censor themselves to spare your feelings. (Thank goodness.) This is why you need to find people outside your inner circle that will commit to reading your manuscript in its entirety. They will be authentic and genuine in their responses. But before we get to the beta reader phase, we have to get through the editing phase. I have been a proofreader for many years now. I’m going to walk you through the process in which I professional use to edit the books of others. It’s a three-step process in which I edit line-by-line, but it’s effective and thorough. Ready? Let’s go! Step 1: Print out a copy of your manuscript. This is easy to do if your manuscript is short, but if it’s novel length, you may consider double-siding its pages. In this stage, I haven’t pulled out my red pen yet. Rather, I am reading for content only. What is the writer’s writing style or writing voice? Reading for content allows me to see how the text is organized. I get a sense of where headers and subheads are placed. Similarly, by the end of the reading, I will have seen any definitions within the content, any charts or graphs or any illustrations. I would have seen all the footnotes at the end of each page. And, I would have seen the outline if the writer provided it to me. If it was a novel, I would know if the hero won or lost his battle. By the end of a non-fiction book, I would have read a citations page, index and/or glossary. But remember, I do this all without marking up anything. The list could virtually go on and on! Your manuscript is unique and has its individualistic issues. But I recommend that you have two books handy for this editing phase: A dictionary and the most recent copy of the Associated Press Style Book. 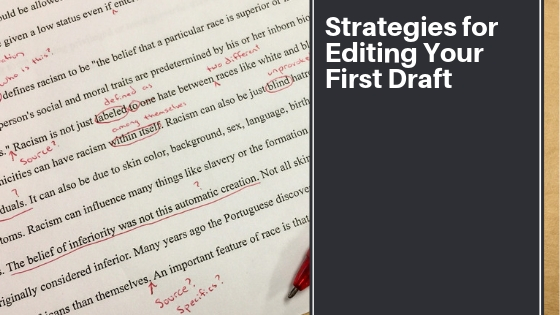 Both of these are going to help you along your journey as you edit your own writing. A thesaurus, too, may come in handy if you find you’re using a word too frequently. Are you at the end of your manuscript? Good. Let’s go at it again! Step 3: There’s not much to do here, but don’t put away that red pen just yet. During this phase, you’re looking for any error that you may have overlooked. You may have missed a spelling error on page 9, for instance, or a run-on sentence on page 56. This third reading ensures that no error goes unchecked. Run-ons are going to lead your reader astray. Many readers find them difficult to read so fix all of them. If you feel that your manuscript is polished and clean, then you’re still not done. (Sorry). Now it’s time to hire a professional proofreader. But hold off on them for the time being. Let your beta readers read your manuscript first. These beta readers are going to suggest changes to your manuscript. You want to make sure that these changes are made. Your manuscript already looks a lot better, though. Even if you’re not self-publishing, editing your manuscript is important. You don’t want to send it to a publishing house or agent unedited. That’s not putting your best work out there. Take pride in your writing. Let those that will publish it—or read it—see your best work. And you’re going to see that all that hard work was worth it.